A command line tool that can install, remove, update, compile packages. A bit like apt-get but worse. This lets you do advanced package management stuff without X. All you need is a terminal. * Pkgdialog needs a re-write in places to make it faster after you chose multiple packages to install/remove/update/etc. ** What Puppy versions does this support? Also tested in Slacko 5.9, Tahr 6.0.2. ** Why should I use this? - you want to make build script and easily compile re-producible PETs. - you want to use SSH, Vagrant or similar to auto build a custom Puppy. ** How is this different from PetGet? - PetGet is a little faster and more reliable. - PetGet can do things Pkg cant and vice versa. ** Why won't TAB complete work for packages X, Y and Z? Maybe the packages aren't in the current repo. Switch repo, or run `pkg which-repo <pkg-name>` to find out which repo the pkg is from. Or, try running `pkg repo-pkg-scope all`. This will slow down TAB autocomplete, but will include all repos by default. To reset, do `pkg repo-pkg-scope one`. ** Do I have to type all those commands? ** Why can't I build packages? You need the devx installed, and Pkg will auto-install petbuild for you. Change BUILDTOOL to 'buildpet' to use that tool instead (it's very similar to petbuild, but older). Change BUILDTOOL to 'sbopkg' to use that tool instead (sboPkg must be installed). 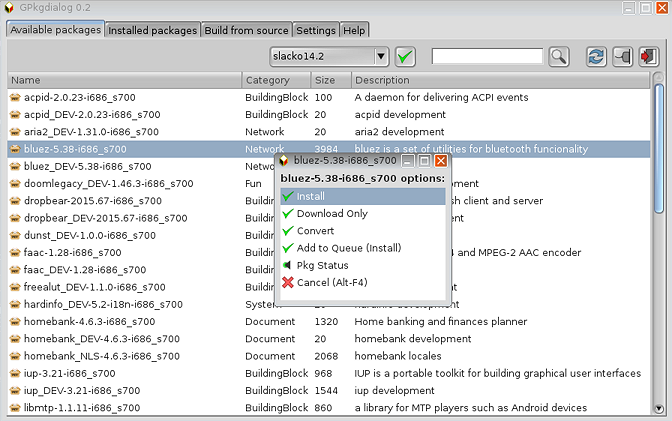 Change BUILDTOOL to 'src2pkg' to use that tool instead (src2pkg must be installed). 6... and many, many more! pkg la # delete all downloaded packages without asking! pkg i /path/to/file.pet # install PET, include the extension! Look at the existing repo entries, then copy, paste & edit the existing entries as needed. - The url1 field is required, other URL fields are optional mirrors..
Run `pkg rl` (or `pkg repo-list`) to see your new repo in the list. Change the default PET handler in ROX to `gpkgdialog` instead of `petget`. This will enable dependency handling for local files! After the puptv PET is installed, so are all the deps! If people use this in Artful or some other pup, but Pkg doesn't have the repos listed, I would appreciate if users could help me support those repo too..
- Name:	the name of the repo. - PkgExt:	the file extension of the packages in the repo. - URL1-4:	the repo URLs, only URL1 is required. - FallbackList:	the order in which other repos are to be searched. If you're unsure, look at some existing sources and copy them. in a text editor, or use 'cat /root/.pkg/sources' in a console. text editor, or use 'cat /root/.pkg/sources-all' in a console. Oh wow, this is so awesome Scott! Nice work man. I was just looking to install pkg for the features I've grown accustom to like installing from the command line or forcing a pet to install, but I see you've added a bunch of new awesome features too! Thanks very much Hope it works OK! Many Ubuntu and Debian users will be familiar with using apt-get and apt-cache. You can now copy and paste commands from Ubuntu and Debian forums and many websites, to easily install packages and follow the commands..
Added a yum wrapper PET to main post. Users who install these apt and yum wrappers should be able to copy and paste many apt-get, apt-cache or yum commands online into their terminal and install stuff easily. The apt and yum lookalike-frontends look great sc0ttman. Commandline package manager facilities like this is what will keep Puppy alive for many years to come (I'd say it is essential). Woof-CE itself is basically, currently, a build system whose useful purpose, it seems to me, is to provide a basic 'recipe' so that when new version of say Debian, or Ubuntu, or Slackware come around, it is much less work than the old days, for a developer to build a new Puppy iso (since just copy old recipe and tweak it a bit as required for new version). Once the new iso is produced, however, for the new flavour, personally I feel that (in current form) woof-CE has done its bit and tinkering with the new iso is a matter of re-mastering to produce 'flavours', which is the same as it always was. I've been recently asked to add features to my makepup script (basically to make it more like mklive-Stretch of DDogs, but truth is debootstrap from Debian is a commandline build system, which woof-CE isn't, so the purpose is different and the frontend is for that different purpose. It would be nice to see a new Puppy build system that works like debootstrap - then it would be easy for anyone to design/make/build their own isos with whatever desktop environments they want - but I really don't see the current woof-CE as being that kind of build system - it is for new one of creations and remastering is then expected in order to modify the new Puppy. Truth is, only one published iso is sufficient - then people can remaster after that. However, a powerful package manager, such as yours is the key to easy and reliable modification prior to remastering; having said that, it could I suppose be built into woof-CE build stages (allowing the mods to be made as part of woof-CE iso creation - then woof-CE would become more flexible and powerful, and then makepup could have buttons etc added to benefit from that addition. So even if woof-CE is never re-written to become like a debootstrap for Puppy, the current one-off woof-CE build script system could become very powerful should it have a reliable dependency-resolving package manager built in for last stages of its iso production. Hoping that will happen one day, and I'd mod makepup to use such new facilities (or some other frontend could be supplied in woof-CE itself, which would be a better approach really, since easier to maintain and easier to code since woof-CE could be purposely made to work with it)..
Keep up the good work and I hope you are dabbling into woof-CE itself to see if you can integrate your package manager capabilities directly in there too. I've been having a play and this is really amazing! the PPM appends installed packages to the end of /root/.packages/user-installed-packages where as pkg sorts 'user-installed-packages' into alphabetical order. Appending makes it easier to uninstall a group of packages & deps you don't want, as they will be grouped together in the list. having successfully used pkg to install kodi & vlc i decided to give it something a bit more challenging 'kubuntu-full'. this actually works when installed from the PPM in bionic but failed with pkg. the PPM installs 380 packages were as pkg only pulls in 316 so it needs to go a bit deeper in grabbing dependencies. i like to add this to xenialpup if the user-installed-packages order can be sorted out.